A 42cm sterling silver necklace with 7 charmlinks on it. The charmlinks sit on a bar at the front of the necklace. One end of the bar unscrews so that charmlinks can be taken off and change for different ones depending on you mood! 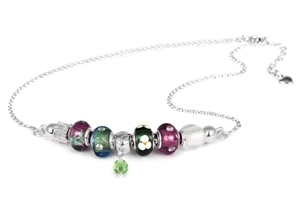 The 7 charmlinks are all sterling silver- some with murano glass.